Go Healthy, Eat California Almonds. There are approximately 30 almond varieties produced in California orchards. Ten varieties represent over 70% of production. Varieties are grouped into broad classifications for marketing purposes based on distinguishing characteristics such as size, shape, and “blanchability.” The majority of almond production in California falls into the following three major classifications: Nonpareil, California, and Mission. Some varieties may fall under more than one classification because they have characteristics of one type (such as Mission) but are also blanchable (a characteristic of the California classification). All California Almonds are developed using traditional methods; genetically modified almond varieties are not planted or available in California. When purchasing California Almonds, it is possible to order either by classification type or by specific variety, depending on what best suits the ultimate usage. Working with your supplier, it is important to understand whether your needs will be best served by ordering a specific variety or a classification type, ensuring the almonds you receive are appropriate for your product line. For example, ordering California type without further information could result in delivery of various almond varieties that also fall under the Mission type, such as the Butte, Padre, or Fritz, which may be a different shape than you need for your application. Nonpareil has the widest range of uses among the marketing classifications. Nonpareil are easily blanched (skin is removed) and cut for processed forms. A thin outer shell and smooth kernel allow for easy, blemish-free processing. As a result, Nonpareil almonds are used anywhere an attractive appearance or a strong almond identification is important. NThis classification includes varieties that are generally blanchable and used primarily in manufactured products. California type almonds have a wide range of shell hardness, kernel shapes, skin color, and surface characteristics. As a result, they are quite adaptable and well suited for nearly any process or application. 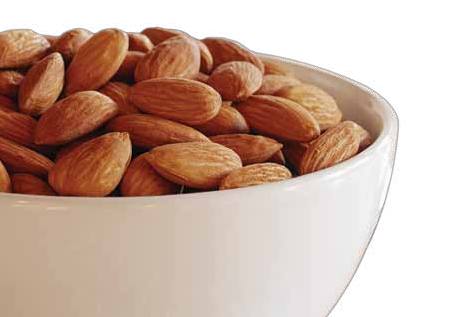 Mission type almonds have a rich flavor, and their kernels are small, wide, and often plump. The kernel skin is generally darker than Nonpareil and wrinkled, which enhances salt and flavor adherence. Blanching is not as common for this type, but some varieties in this classification are blanchable.